In the spring of 1963, shortly before that memorable canals holiday, the family had moved further south, to Crawley in Sussex. 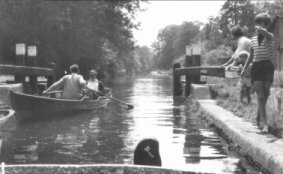 Other than our annual holidays, boating was limited to punts and skiffs hired from Farncombe Boat House at Godalming or the boatyard in Guildford. A 1968 Wey trip. This time in punts! By the late 1960s parents were left behind and the trips were made with friends from work. My brother, Mike, would usually come as well. Indeed it is his colleagues who are rowing into the Unstead Lock in the picture here. 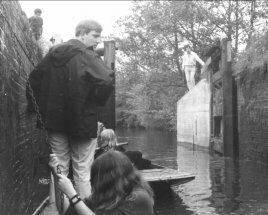 Mike is seen again, on another trip, this time in punts, opening the lower gates of the same lock. In the summer of 1966 my brother and I had a fortnight aboard a beached Thames sailing barge. It was used by the County Council's Youth Service as the base for sailing courses and is where I lerant to sail, aboard Enterprise and 420 dinghies. After that, apart from holidays on the Norfolk Broads, there were a couple of summers when sail boats were available for hire by the half hour at a municipal boating pool at Lancing. It remains the only municipal boating lake that I have encountered that actually hired out sailing dinghies on this basis, along with the more conventional canoes, pedalos, and small outboard powered launches.